Our Medicinal Wool Felts are unique and versatile. 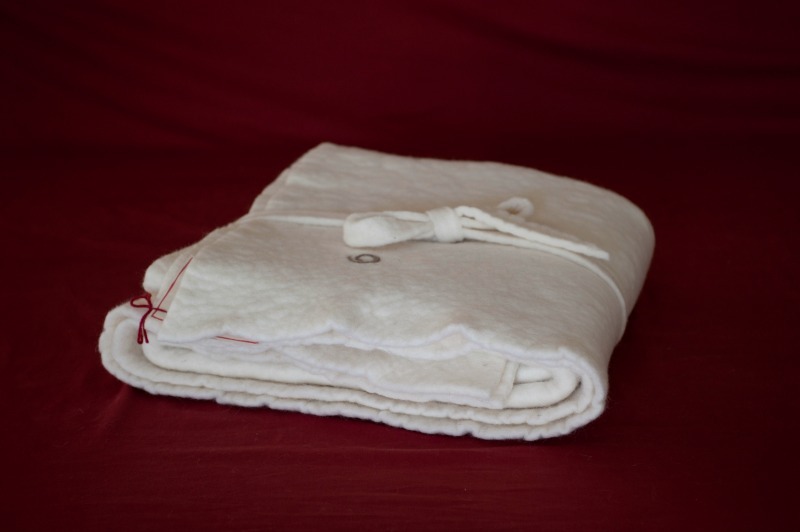 Made of 100% wool, these wool pads are available in several different sizes and can be used as a mattress topper, car seat pad, rug, camping pad, massage pad or anything else you can think of. 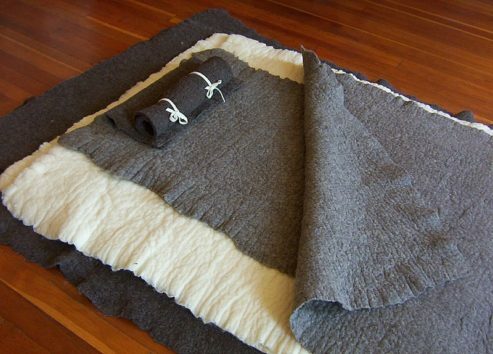 Our light wool felts are New Zealand “World Class”, ecologically produced wool. Our dark felts are domestically produced wool. Our light wool felts ship out usually within a few weeks. Experience the direct benefits of wool with our versatile Heartfelt Wool Medicine Felts. 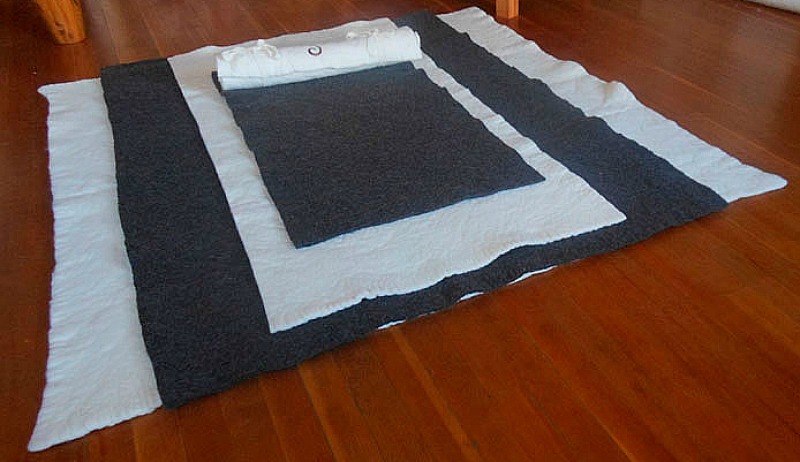 Wool felts work great as a top layer on a your bed since they are hand washable. Thick and cozy, wool felts are the perfect addition to every bed. Keep in mind that each Heartfelt Wool Medicine Felt is a piece of art and may vary within a few inches from the advertised size. Our natural/ivory colored wool felts are 100% “World Class” wool from New Zealand. The colorful Heartfelt logo is placed in the corner of each felt. Our naturally dark colored wool is domestically produced. The color varies from a dark charcoal or brown to lighter, mottled grey. The color changes are according to wool availability and we are unable to guarantee an exact shade. The dark wool is perfect for use on the floor. A grey version of the Heartfelt logo is placed in the corner of this felt. Each felt is created by pouring hot soapy water on batting and then stomping on the wool. This process causes the fluffy wool batting to shrink into a dense solid pad. We complete the process by washing the felt in a washing machine. The result, is a beautiful, thick, hand washable wool pad that can be used in so many ways! The kids are sleeping better and longer hours! We got Heartfelt Wool Medicine Felts for each of my kids’ beds a couple of months ago. Since then my 5 year old son and 7 year old daughter have slept deeper (wake up less in the night) and sleep in longer than before. Especially my son loves how cozy it feels and will lay in bed day dreaming in the mornings until we snuggle him out of bed! My daughter said her bed feels like “a warm hug that wraps her up at night.” The felts are really affordable and once the kids grow out of their beds we can use the felts for the couch or picnic-ing etc. Thank you Shepherd’s Dream! Thank you for kind and informative review! 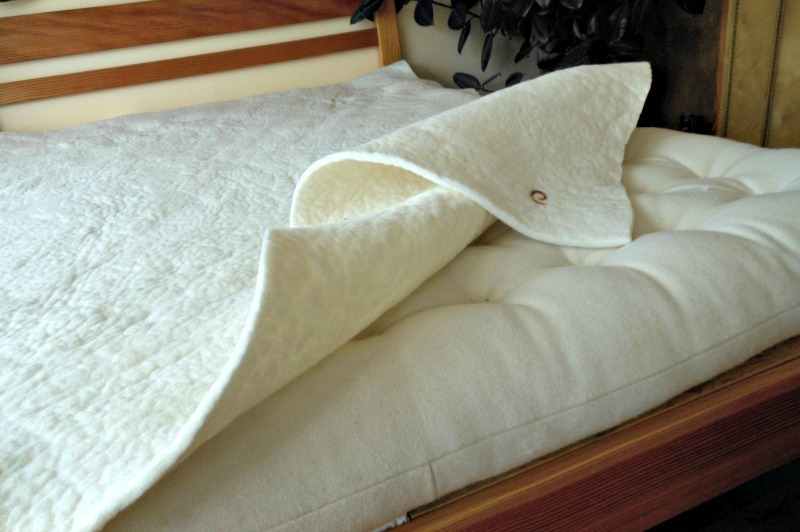 We are so happy to hear that your wool felts are improving your children’s sleep! This kind of news inspires us to keep doing what we love to do! Sweet dreams! I used to say quiet little mantras to go to sleep. And they are all very helpful. i love my bed. i love my bed. I love my bed. The deep medicinal purposes of these wool felts cannot be over-expressed. Truly healing. Quiet and supporting. So wonderful! Eliana Jantz, the founder of Shepherd’s Dream and the creator of our Heartfelt medicine felts, will be so happy to hear this. May you continue to sleep soundly with your collection of wool felts! We appreciate your positive support! I am now buying my 3rd medicine felt. I prefer to sleep on a hard surface with only 1 to 1.5 inches of cushioning to protect my skeleton and muscles from getting sore. But I was having trouble finding the right material that would give the right amount of support. These felts are perfect! They’re warm without causing me to overheat. They’re soft enough to feel comfortable without making my back sore. I love them a lot!The thickness of each felt really does vary, so don’t expect industrial standards. You don’t need them because these felts are AMAZING!! So happy to hear you are enjoying your woolen felts! We are happy you found us and that you are sleeping in comfort with your wool felt stack! We appreciate your support and wish for you many sweet dreams! In July of 2017, we bought 8 queen sized wool felt pads to replace our conventional mattress. It was significantly more firm than our conventional mattress had been but it only took us a few days, less than a week, to become accustomed to it. We both love it. It keeps us at just the right temperature through both summer and winter, and as a bonus we find it easier to sleep while backpacking with just the sleeping mat because we are already used to a firmer sleep surface. It has not “settled” or “compacted” hardly at all in the time we’ve been using it. Thank you for taking the time to leave such a thoughtful review! We are happy to hear that you are enjoying one of the many benefits of wool: temperature regulation! We appreciate your support and hope you have many sweet dreams!